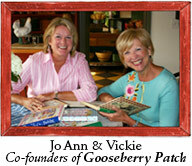 Welcome to Gooseberry Patch...we're so glad you've stopped by to say hello and we hope you'll stay awhile. You can shop our newest cookbooks with ease, watch the video trailers for each one and even get some sample recipes too! Thanks to our simple Store Locator, you can now find our cookbooks in your neighborhood too. Just enter your zipcode and it'll supply a list of independent sellers in your area...easy! In addition, our Free Goodies page is packed with recipes, /gooseberry/database.nsf/f.freedownloads">printables and tools to help you keep track of your favorite recipes. Be sure to visit this page every month for a brand new digital wallpaper, updates to our Cookbook Collectors Checklist and so much more. Be sure to join us on our Page on Facebook, Twitter and http://pinterest.com/gooseberrypatch/">Pinterest, where we're sharing all the best inspiration we can find, along with some exclusive bonus goodies there too! P.S. We couldn't create our cookbooks without everyday cooks just like YOU! If you have a tried & true recipe that you'd like to share, we'd be happy to consider it for an upcoming cookbook. Click here to get started!